Tel Aviv, March 21: Israel Prime Minister Benjamin Netanyahu will visit Washington next week on an invitation extended by President Donald Trump, CNN quoted White House press secretary Sarah Sanders as saying on Wednesday (local time). 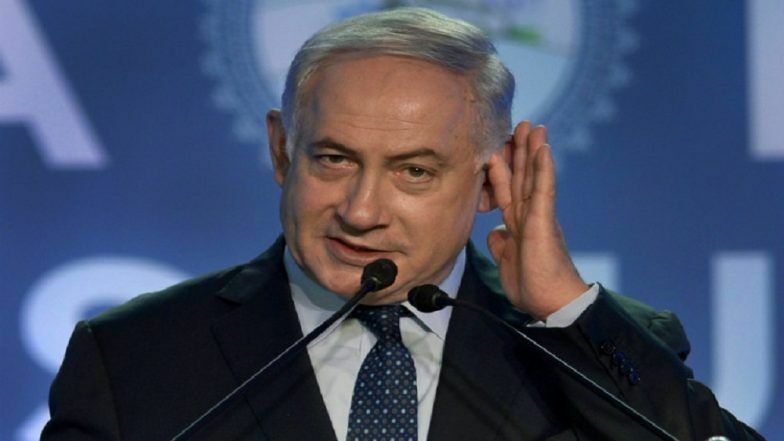 Netanyahu's visit comes just two weeks before the upcoming Parliamentary elections in Israel, scheduled to take place on April 9. The visit has been further scheduled when the Israeli Prime Minister is facing corruption charges in his country. The Prime Minister, however, last year had clearly stated that he would not resign even if he is indicted by the attorney general under one or any of the corruption charges against him. Denying the three corruption charges against him, Netanyahu cited legal procedure while asserting that the law doesn't require him to step aside before any hearing. Benjamin Netanyahu Seeks to Calm Israeli Concerns Over Donald Trump's Syria Pullout. Netanyahu is facing a tough challenge over the upcoming general elections, which will determine whether Netanyahu stays in power or not. Al Jazeera reported that the US Secretary of State Mike Pompeo, who travelled Jerusalem on Wednesday, hailed strong ties with Netanyahu and vowed to counter the Iranian "aggression". Pulwama Attack: ‘My Dear Friend, We Stand With You’, Benjamin Netanyahu Tells Narendra Modi. Netanyahu, who is also scheduled to attend the annual conference of the American Israel Public Affairs Committee (AIPAC), next week, will be meeting Trump twice.